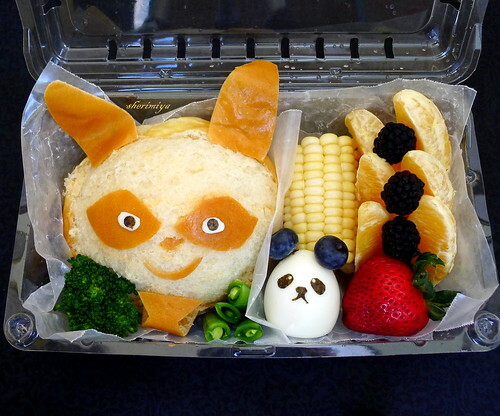 Shifu and Kung Fu Panda Field Trip Bento, a photo by sherimiya ♥ on Flickr. 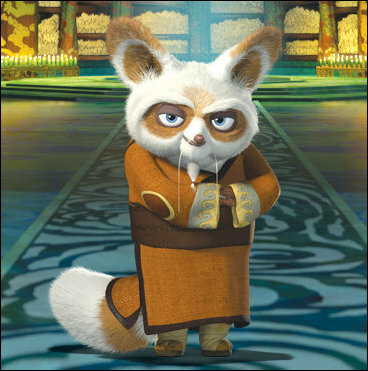 It's another field trip bento for tomorrow: I packed MisterMan a char siu bao decorated as Shifu from Kung Fu Panda. To remove the brown top layer of the bao, I slipped my small paring knife underneath and it came apart easily. His eyes are made from cheese stick and nori. Did you notice his goatee? I also added an egg panda decorated with blueberry ears and nori facial features. On the side: corn on the cob, broccoli, peapods, oranges blackberries and strawberry. Everything is wrapped in wax paper and packed in a recycled self-sealing strawberry box for disposal after use. All finger foods make it an extra bonus; no utensils needed. Have fun! So cute!!!! I love Shifu's little goatee :D What a fun field trip lunch! this is just so hilarious.. absolutely cute! haha..
SOOOO AWESOME!!!! I bet Mister Man's friends were all jealous! I love Kung Fu Panda. Everytime I watch it I am always reminded the phrase: "Yesterday is a History, Tomorrow is a Mystery, Today is a GIFT, that's why they called it Present". LOVE IT!! OMG, this is the bomb!! So awesome! I have to show K tonight. She is so going to love this. So many field trips.. your kid is so lucky! Both for the trips and for the amazing Mama! So delightful, love every cute and funny detail!! 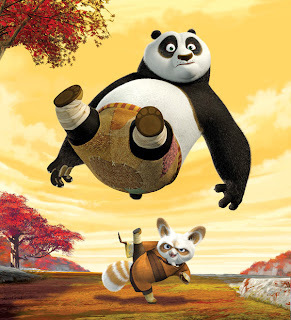 As you may have noticed I am OBSESSED with pandas... I adore this bento and want to use that pic as wallpaper. Kawaii!! That's so creative! I love it. What a cute, cute post! I love it! Thanks for sharing your Bento art with the rest of us in our Bento challenge! Is this post awesome or what!